One vegetarian mom + one omnivore dad and two undecided kids = one [COMPLETED, HOORAY!] New Year’s resolution to create a ‘blended-family’-friendly vegetarian recipe every day—converting traditional family-favorite meals into meatless recipes that even picky kids (and husbands) will love! Stay tuned this year for our journey incorporating more whole foods! **Congratulations to the USA Pan Winners! ** When we lived in Colorado (age 3 to 5 for me), we had an amazing garden and an equally amazing next-door neighbor named Darla. She had several delicious zucchini recipes with my mom that we still make today. 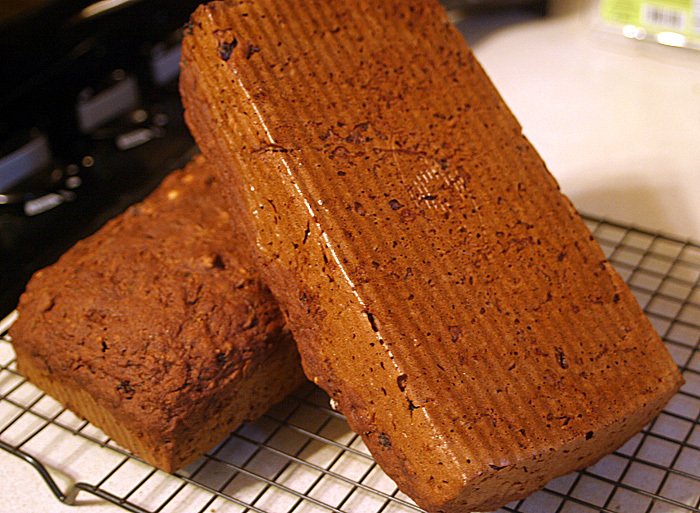 When I first decided to make my own zucchini bread, I went to my trusty Betty Crocker Zucchini Bread Recipe, which I later made into muffins. The muffins, and the bread, are delicious. But it's not quite like the zucchini bread I remember from my youth. 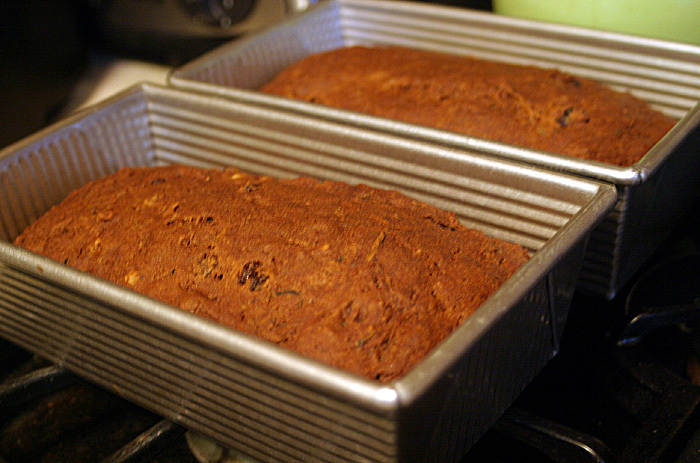 So I finally broke out the "Mom's Zucchini Bread" recipe (which she's quick to remind me is actually Darla's). I've made a couple of minor updates to fit our new whole food lifestyle, but the heart of the recipe is the same. And my kids went absolutely crazy for it, much like I remember my sister and I going crazy for our zucchini bread at that age. Great memories and a great recipe. When I got the ingredients out for the recipe, I realized I was out of eggs, so I went vegan sort of inadvertently this time. I couldn't be happier with the results. Today is also the day to announce the winners of the USA Pan Giveaway. Congratulations to the winners! I have contacted both winners with requests for shipping information. Please contact me within 48 hours to redeem your prize or new winner(s) may be selected.. Didn't win? Don't fret, check out USA Pans on Amazon. Preheat oven to 350. Mix together and put in loaf pans (2 small or 1 large). Hopefully in the beautiful USA Pan loaf pans you won! Bake at 350 for 1 hour to 1 hour 15 minutes until a toothpick comes out clean. The kids went insane for this bread...Bug asked for FIVE slices. With the protein and Omega 3s in the flax seed, it's a pretty complete meal, too. So I was very excited that they loved it. I really liked this bread too. It does taste a bit different with the flax seed "eggs," and it's not quite as sweet since I cut the sugar down from 2 cups. But I really love it. Strangely, I like it better when it cools down! 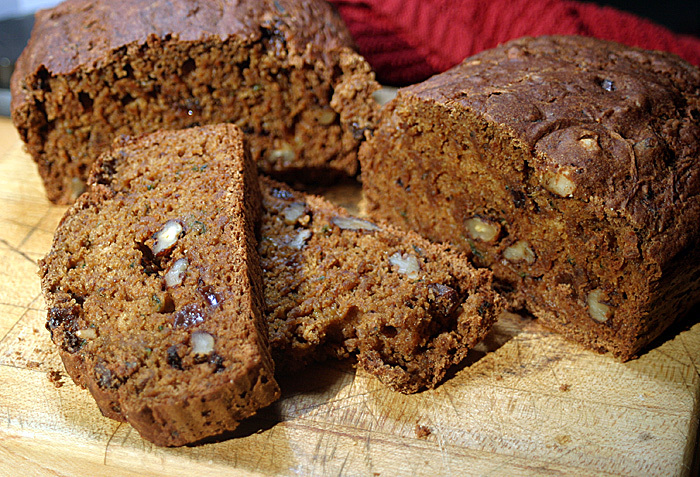 The meat-eating hubby liked this tasty zucchini bread treat, too. That's a big win, since he's not as big a fan of zucchini as I am. Yes, that's an imprint of the USA Pan logo on the bottom of my bread! That's how well the loaves come out of the pans! Awesome, right? This post is shared with Real Food Wednesday, Whole Food Wednesdays, What's Cooking Wednesday, Works for me Wednesday, These Chicks Cooked and Bake with Bizzy, Hearth and Soul Hop. Note: While USA Pan provided me with pans for the giveaway, my opinions are 100% my own. See my full disclosure policy here. This promotion, open to U.S. residents only, is in no way sponsored, endorsed or administered by, or associated with, Facebook. I hereby release Facebook of any liability. Winner(s) will be contacted by email 48 hours after the giveaway ends. If you have any additional questions - feel free to send an email to veggieconverter@gmail.com. Today's This Week's Cravings theme is MEXICAN FOOD / CINCO DE MAYO and I'm sharing these delicious Fajita Burgers over at OnceAMonthMom.com. These burgers are a great option for an American/Mexican fusion meal for Cinco De Mayo. I served ours in yellow bell pepper rings and offered dried red pepper flakes for the adults. The meat-eating husband LOVED these! I was so happy about that, since sometimes the meat burgers can be not so burgery for meat-eaters. And then, huge bonus, the kids gobbled them up, too. I, of course, thought they were absolutely fantastic. 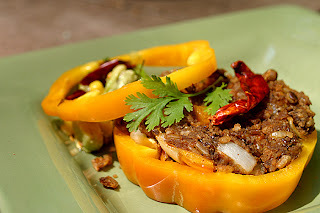 The bell peppers were crunchy enough to be delicious, yet cooked enough to be slightly caramelized. Yum. A definite repeat. My This Week's Cravings co-hostesses are: Tina at Moms Crazy Cooking and Nicole at The Daily Dish. As hostesses, we will try our hardest to visit as many of the links we can. We all enjoy your links and look forward to gathering recipes each week. The party has a few SIMPLE RULES and all of the themes for the entire year are list here on the THIS WEEK'S CRAVINGS tab at Moms Crazy Cooking. Plan ahead, check out the weeks you want to make sure to link up or just browse them to see what's going on. This Week's Cravings Upcoming Linky "THEMES"
Here is a complete list of the past and what's coming up next on THIS WEEK'S CRAVINGS! May 14: EGG recipes... Casseroles, Egg Dishes, Hard Boiled or Appetizers too! May 21: Memorial Day BBQ "ALL RECIPES WITH BBQ SAUCE or ON THE GRILL"
If you are a regular link-up we're excited to see what you made this week. If you are new please read and follow the simple rules, so that everyone can enjoy the linky party! If you forget to follow the theme, your post will be deleted. Please don't feel hurt, just come back and link up a recipe that follows the theme. Thanks a million, we look forward to blogging with you! (c) Veggie Converter 365. Powered by Blogger.